As dark clouds gather over Brittany once again, it’s whispered that a Traitor may be conspiring against the Round Table to bring down the kingdom. Band together with your allies to dispel these rumours and defeat the Shadows. 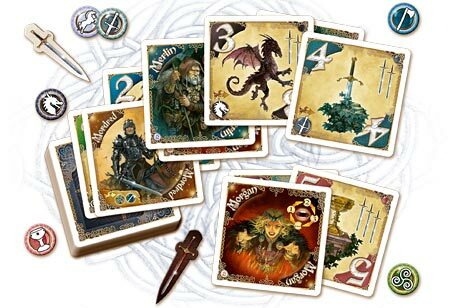 Announcing Shadows over Camelot – The Card Game. Based on the award-winning cooperative board game released in 2005, the Card Game follows in the footsteps of the original, as players work together to defend Camelot against rumors swirling about the kingdom. The fast-paced game invites players to take on the role of sons & daughters of the legendary Knights of the Round Table; together, they must unite to defeat the game’s threats, represented by a deck of Rumor cards that swirl around Camelot. Once again, the Knights face Traitors in their midst as loyalties are tested and may even switch sides during the game. 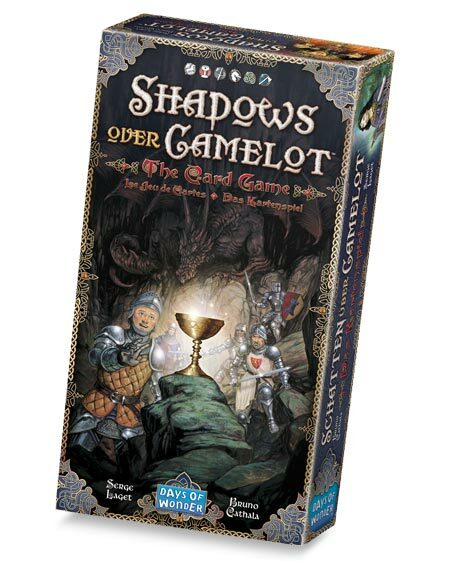 Shadows over Camelot – The Card Game includes a deck of 62 Rumor cards; 9 Knight cards; 9 Loyalty cards; 10 Quest Tokens and 16 double-sided (black and white) swords. It is a stand-alone game that takes approximately 20 minutes and can be played with 2-7 players, as well as a solo game. It is expected to be available in Europe in mid-October at the Essen Spiel and in North America in late October at a retail price of $25/€23. This entry was posted on Monday, August 27th, 2012 at 13:00 and is filed under Games, News, Shadows over Camelot. You can follow any responses to this entry through the RSS 2.0 feed. Both comments and pings are currently closed. Looks like a fun new version of Shadows over Camelot!! My wife and I love the cooperative nature of the board game, so this should be fun! My fav. Please bring this and ticket to ride to windows phone!